Xin Inventory 2.0 is a comprehensive, handy, cost effective and network ready invoice software with stock control features. It helps in stock control and speed up billing process by creating quotation, invoice, PO in minutes and email to customer. Download and install for 30 days full-featured trial. Have you ever wondered what it would be like to manage quotation, invoice, purchase order, credit note, delivery note, inventory, customer payment by using one software? As a business owner, you’ll know that proper management of quotations, invoices, customer payment, purchase order (PO), credit notes, delivery notes/packing slip, inventory, and stock is a tedious job that needs to be controlled with great care in order for the business to run effectively. It is crucial to any business long-term survival and the lack of proper management can be disastrous and costly. This can be worsen if involve stock management and customer payment tracking. All of this could be changed with comprehensive, cost effective and user friendly software that can handle all the task mentioned above. 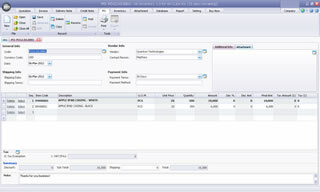 A good inventory management software not only able to work well in managing of quotations, invoices, customer payment, purchase order (PO), credit notes, delivery notes/packing slip but also records customer sales in real-time and automatically reorders stock when it reaches a pre-determined level. It works to ensure that your business will only carry the necessary amount of stock and stay aware of which stock need to be replenished or shifted to keep costs down. With such a system, you could handle multiple task with ease, such as creating purchase order, receiving payment, create invoice, scheduling recurring invoices, creating credit notes, packing lists, store receiving, and more!! 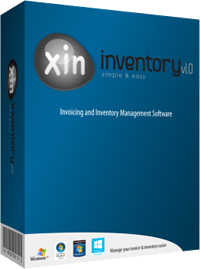 Xin Inventory Software Is An All-Inclusive Invoice & Inventory Management Solution! Xin Inventory Software is a comprehensive, smart, cost effective and all-inclusive productivity management solution for today’s needs. This software takes care of all your business needs; making it the only software system you’ll ever require for daily operations of your business. 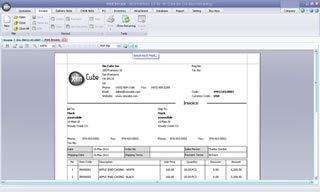 In addition to manage inventory, it also integrates the quotation and invoicing module. This all-in-one software is a platform packed with amazing features to help you stay on top of your business operations at all times! Get organized with Xin Inventory and never worry about losing track or control over your stock! The stock control features and automatically reorders stock when it reaches a pre-determined level to ensure that every purchase order is fulfilled without having to wait for restocks. The software’s built-in templates will have you look professional at all times. Just add your business logo and choose from professional-looking Purchase Orders, Invoices, Quotations or Estimates, Credit Notes, Delivery Notes or Packing Slips, Customer Statements and more! You also have the flexibility to create your own or edit existing templates to fit your needs. With Xin Inventory’s ability to track customers’ payment status, you’ll never overlook any customers who are behind in their payments again. There is nothing more important to a business than a good flow of revenue to maintain efficient operation. Xin Inventory features customizable reports providing detailed and summarized information on sales, revenue, profits and inventory levels. This powerful feature can help you better plan ahead and tweak your business strategies for ultimate success and see how your business is doing on paper! Multiple User, Tax and Language! Xin Inventory 2.0 supports multiple users with different rules or user group. System admin able to create own user group with dedicatated user accessibility to different module. In addition to this feature, the software supports and processes multiple tax rates, such as the regional State Sales Tax (US), GST (Australia, New Zealand, Canada), and VAT (UK, South Africa). It also has an option to define your own tax rate making it a simple and burden-free tax calculation system. Not only that, Xin Inventory is available in English, Spanish, Chinese, Malay, Indonesian, Slovenian, Slovak, Croatian, Dutch and Japanese! 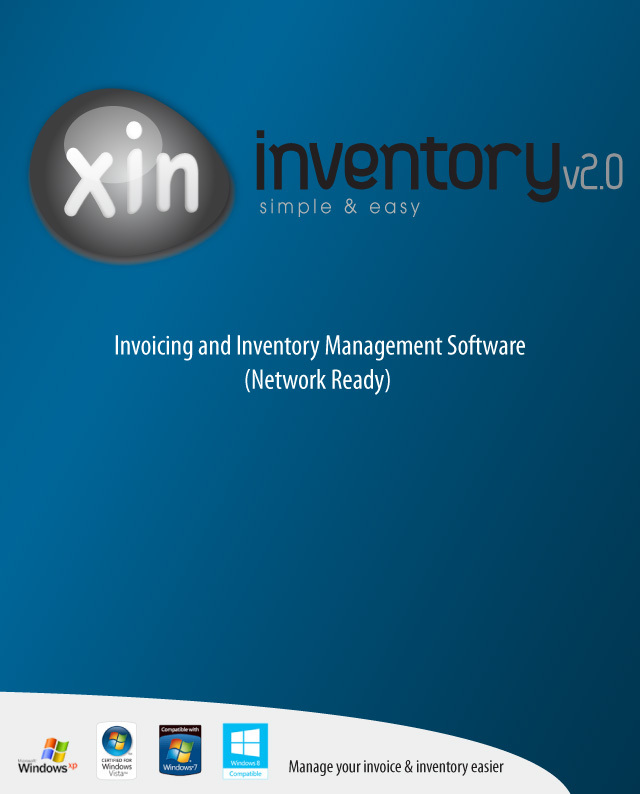 Xin Inventory 2.0 is network ready invoice software. By apply the correct setting, the database can be accessed by different computer at the same time either using same user account or different user account in the same network or LAN. In Xin Inventory 2.0, data is password-protected so you can restrict access and have peace of mind that only the right people are allowed to view and share important purchase and inventory information. System administrator able to create own user group according to their needs and assign user to the correct group. Stay In Control with Xin Inventory! There’s no better way to get your business organised and enhance efficiency while looking professional and staying in-sync with your business all at the same time! Download the Trial Software Now! Xin Inventory 2.0 is a network ready stock control software and for windows with new features is now released. Check out our 30 days trial version or buy now with one cost off . 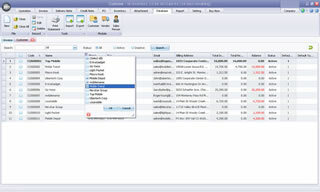 Xin Inventory 1.0 is stock control software and for windows. First rate software! Easy to use, highly configurable templates and a responsive support team who act on your issues/suggestions. I've tried dozens of programs where you have to accept a compromise somewhere, but Xin Invoice is awesome! Your Xin Invoice software is fantastic and so is your support service . 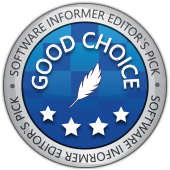 After 20 years in business and a slave to the Books software and the outrageous pricing from them I had enough, I then turned to Xin and they where the right price and the software was just what I needed. A new satisfied customer, Thanks! The software is user friendly and easy to use for beginners. This product is just the program I need for my business. Easy to use no extra work with good looking invoices & delivery notes. Wish I had found it before. Your program is just superb, user-friendly and cost-effective. Thanks! I am very happy to say: This program is so user-friendly and the staff is so very helpful. + Inventory popularity report & more ..
Xin Inventory comes with professional purchase order (PO) template, invoice template, quotation template, debit note template, customer statement template and others. This inventory software / stock control software also comes with user friendly template editor to allow you to manage your own PO template, invoice template, quotation template and etc. You can check on more Purchase order template, PO Template, invoice template, credit note template, delivery note template, quotation template and etc @ Xin Inventory Software inventory management software. Xin Inventory software comes with handy and simple interface. You can even change the skin according to what you like. Below are the screenshot for some of the modules. Xin Inventory full features. It's download 30 days free trail for Xin Inventory 2.0. No obligation to buy. Download and try. I searched for a long time to find software that would keep track of inventory along with customers and invoicing. I had Quick Books for many years and was terribly dissapointed in it. Xin was the only soft ware that had all the features I needed! I downloaded it easily, added my inventory and customer info and ...bam..ready to go! The only thing that has given me troble is customizing the invoice template. But Customer Service is fast and helpful...so I would give Xin a complete thumbs up! Since the program is not Microsoft Office based it takes time to find out, how things have to be done, but almost all demands our company has had towards an inventory and invoicing software were met. Especially the service including technical support for all kind of questions allways within 24h should be mentioned here.